Cook County has now released, by Precinct, the results of the HMS Referendum. For those readers interested in analyzing where the Yes and No votes were cast, we have provided the results below. 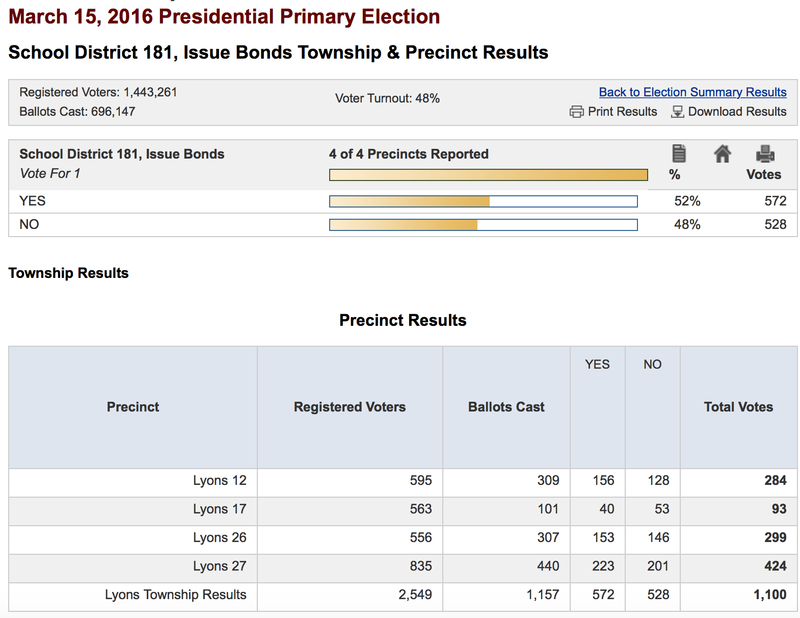 DuPage County has not yet issued the results, but when they do, we will publish them. We have just received a comment from Mr. Jay Wick, which we are posting as our Comment of the Day. It is a recap of what occurred at yesterday's Facilities Committee Meeting. As another reader pointed out in an earlier comment today, for some reason, the Podcast Audiotape of the meeting cuts off after less than one minute. Hopefully the Administration will explain this latest snafu and get the tape up ASAP! The purpose of the FC meeting yesterday was to begin discussing next steps as relate to Hinsdale Middle School, now that the Referendum to build a $65 million school has failed. I had some free time and I did attend the facilities committee meeting. Given the long list of items that was generated in this week's special BOE meeting things went fairly smoothly and the meeting wrapped up around 6PM. It is clear that there are differences of opinion around the perceptions surrounding the current concept for HMS / potential "lightning rod" features. Some facilities committee members very strongly believe that sticking with the current architect could doom any future attempts at winning broad support. Similarly, there are strong opinions about what truly might motivate folks to support a replacement for HMS. There seems to be a lack of understanding of what steps might satisfy community members concerned with things like mold and general indoor air quality -- the leaks that have been publicized directly over the 3rd floor gym are unlike the longer term hidden leaks and improper maintenance that were uncovered during clean-up of the catastrophic water intrusion caused by frozen fire sprinklers; these present leaks are largely from the failing flat roof and since they are quickly addressed are unlikely to contribute to the growth of mold. Even mold that was uncovered while extensive interior refurbishment was undertaken was largely not of the airborne varieties, but was sent to testing labs after surface swab tests to determine the best remediation efforts. HMS' staff has noted no soaked ceiling tiles and the efforts to have non-absorbent baseboards and made water wicking up walls far less likely. That said, the district staff will undertake scheduling air quality testing both while the building is vacant over spring break as well as scheduling additional tests in a variety of classrooms while they fully occupied. Results of these tests will be published on the district web site. Concerns about any possible issues related to water quality were deemed largely to result from hypersensitivity related to media coverage of events in Michigan. The consensus was generally toward getting solutions ASAP to ensure all students and staff have the safest environment possible for the minimum of three years that the existing schools will be in use, and hopefully this will restore confidence in the district's efforts at responding to such concerns. There was similar consensus that the initial estimates and subsequent increases in total "all in" cost were a factor in the defeat of the proposal. How best to communicate that efforts were undertaken to ensure that cost per square foot of the project is inline with similar efforts, on what is essentially a complex semi-urban site vs the more common "green field" sites selected for middle schools, was also discussed. Additional analysis of voting trends will be made when precinct level details are available. The assistance of survey firms may also be called upon. The district staff was generally aware of how challenging the timing might be for a November ballot question, as well as problems with timing a question that either interferes with ballot questions from other districts or potential School Board elections. This morning we received the following comment informing our readers of a Special Board Meeting that has been scheduled for Monday night to discuss the HMS Referendum. As soon as we saw this comment, we checked our emails to see if as D181 parents, we had received email notification about the meeting from the D181 Director of Communications. We had not. Why wasn't an email sent out informing everyone about the meeting? It is simply unacceptable that this simple step wasn't done at the same time as Board Docs was updated. We certainly hope that people on both sides of the issue show up to Monday's meeting. It is time for the community to come together and constructively figure out the next fiscally responsible steps to address HMS' pressing needs. This morning we received a series of comments from highly respected, D181 resident, former BOE member and active D181 Committee Volunteer -- Ann Mueller -- addressing one of the two new Curriculum Department hires. We think Ms. Mueller's comments are spot on and are therefore publishing them (the portion dealing with Curriculum) as the Comment of the Day. As always, SOUND OFF -- however, in the interest of being constructive, we will not publish comments that are simply attacks on past administrators. It is time to look to the future and be positive and hopeful in our commentary. I would like to answer both 3/16, 8:15 am and 3/17, 10: 04 am's questions about both the interview process for the new Asst Supt. of Learning and the actual individual selected, Kelley Gaullt. I was a member of the interview committee for this position. Kelley Gaullt was absolutely my #1 choice of all the individuals interviewed, even above the person first offered the job who turned D181 down. I didn't select the individual who first turned D181 down as my first choice, because I could tell that person was only going through the interview process in order to go back to their current district and get a longer contract and more money. And, that is exactly what happened! I've seen it happen before. You know when a candidate walks out the door and tells you "Good Luck!" that they aren't genuinely interested in the job! Anyway, as a former teacher, D181BOE member and BOE president, and someone who experienced D181 at its best, I absolutely recognize, as mentioned, that D181's curriculum is a "hot mess. "The last eight years have been a disaster in D181 in the area of curriculum. D181 is absolutely in great need of an educational leader who can assess the D181 situation by talking with teachers, administrators, parents, and other community members and then, with the knowledge of best practice and appropriate educational approaches for D181, assemble a plan for D181, roll out that plan and assess the plan's outcomes. I genuinely believe that Kelley Gaullt has the background, experience and knowledge base to do exactly what D181 needs! Part 2: In reviewing the Dept. of Learning in D181 over the last 8 years, we have experienced Asst. Supt.s for Learning who may have had PhD's, but in the case of one individual, the PhD was in facilities, NOT CURRICULUM. Therefore, this person knew nothing about curriculum and that was the beginning of the "hot mess!" In addition, while this individual was head of the Dept. of Learning, other individuals were added to the D of L, who may have had PhD's (again NOT IN CURRICULUM) and there was a case that D181 actually PAID FOR a person's PhD, but they were worthless!!!! Perfect example where experience and actual knowledge gained on the job trumps rushing to get a degree every time. It is unfortunate that in today's education world, very few administrators take the time to gain the actual work experience and knowledge base along with the graduate degree, like in the "old days." In general, today's administrators rush to get a degree, in order to increase their salaries, but do not have the work experience and knowledge base necessary to do the job. Have we seen this situation in D181?? YES!!! There were and are administrators in D181 who had/have higher level degrees and KNEW/KNOW NOTHHING!!! That is why D181 has experienced 8 years of curriculum "downfall!" Also, I need to mention, administrators in D181 recently that have been elevated to positions that they had no training or experience in, but for some reason they ended up in the D of L. I don't need to name names because you know who they are. Fortunately, one is leaving and Dr. White and the BOE had better get rid of the other before Kelley Gaullt joins the district. Kelley's job of fixing the curriculum mess in D181 is a big one and will take time. She is up to the challenge and has the knowledge base and experience, but she should not have to deal with the inept current people who NEVER belonged in the D of L to begin with! Kelley needs to be able to come in, assess the messy situation in D181 and develop a plan to fix the "hot mess." She needs to be able to have people she trusts and knows have the knowledge base and experience to help her with the D181 challenge. She needs her own people, not worthless individuals who have sucked up to pervious superintendents to get elevated to positions they had no business ever being in. As you can tell, I feel very strongly on this point. If Dr. White does not let Kelley do her job...come in and assess the situation by talking with teachers, administrators, parents and community members then develop a plan to fix the D181 situation with the people she needs and trusts...then he needs to go. This will be a huge test of Dr. White's perception of what now needs to happen in D181 since he really blew it to begin with. You know what I mean!!!!! Enough lamenting, but it is painful to see what our D181 students have been exposed to or not exposed to over the last 8 years. Our students are resilient. However, I can't help but think how well they'd be doing if they had been exposed to the right things! To have to now overcome exposure to inappropriate or lacking curriculum is a shame. But, believe me,your children can and will do it. And, they, in all probability, possibly will be better students for it. Regardless of our desire as parents that our students only experience the best their whole lives, life presents challenges. As a former principal at Elm once told me, it is far better that our children experience failures and challenges early in life and learn from these challenges so that they carry on in their lives with the necessary coping skills to be successful. I have seen proof of this in my adult children's lives. Part 3: I'm almost finished. As far as Kelley Gaullt's background and experience in education, the reason she was my first choice for the D181 position of Asst. Supt. for Learning is because she has experienced and done it all! She was a classroom teacher, a specialist, an assist. principal, a principal and, finally, a curriculum person. And, as a curriculum person, she worked in a K-12 district and had SpEd as her responsibility, too. Believe me, you just don't see educators with this depth and breath of experience anymore. They just don't exist anymore. On top of Kelley's knowledge base and experience, my perception is, and I have also been told this by someone who has worked with Kelley, that Kelley possesses exceptional people skills. D181 has NOT experienced an Asst. Supt. for Learning with that skill set for a very long time. My understanding is that Kelley is a "child centered educator." She wants what is best for kids. That will be a new and different experience in D181, too. I don't mean to be horribly sarcastic, but it is about time D181had an administrator who cared about kids and not just about themselves and their career. Please, give Kelley Gaullt the chance she deserves to do right by our students. She will need your support for her to make the changes necessary to bring D181 back to being the"lighthouse" district it use to be. She knows what to do because she has done it before. Let's help her in any way we can. Our students deserve the best." BREAKING NEWS: Unofficial Results -- The HMS Referendum Fails. 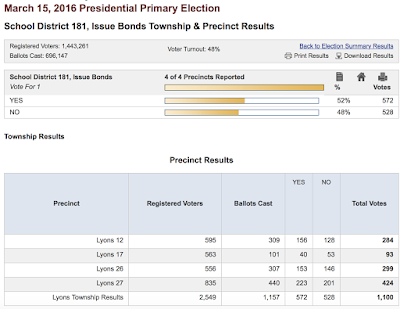 With all precincts reporting as of 11:30 pm., 9878 D181voters have spoken* and the democratic decision was NO to issuing up to $65 million in bonds to build a new Hinsdale Middle School. Below are the results by county. * These unofficial results do NOT include late absentee ballots which have not yet been tabulated. With the election only two days away, we wanted to present you with additional information that was not included in the HMS Mailer (paid for with Taxpayer dollars) that the D181 administration sent to all D181 Postal Patrons last week. Our original plan was to go Fact by Fact through the district's mailer, but shortly after we began this exercise, we realized that we don't need to go beyond Fact 1 to establish that this Referendum has been a RUSH to the polls, done in complete disregard of the NEEDS at other schools and the Future Fiscal Health of the entire district. We believe that after you have read the additional information we will provide below on Fact 1, you will agree that before the BOE asks us to approve a $65 million project ($90 million with bond interest) to build ONE school, it must hold additional public meetings to FINISH the Facilities Master Plan. The BOE must first address the NEEDS at ALL NINE of the district's schools, vet and discuss ALL of the Capital Projects identified (and excluded) in the Facilities Master Plan in the context of discussing the district's fiscal future, and actually VOTE TO APPROVE the Facilities Master Plan. It has not done so as of today's date. We believe you will agree with our conclusion that the ONLY responsible vote on March 15, 2016 will be a NO vote! Fact 1 Presented in the District's HMS Mailer states: "Our Facilities Committee, comprised of parents, residents, staff, and Board members, has worked for more than two years to create a District-wide Facilities Master Plan supported by multiple data points and benchmarked against standards. This work has included special focus on HMS, which stands apart from the other D181 schools in regard to the level of its building challenges." by the FULL BOE, finalized or approved by the BOE. The Title of the Mr. Surma's Memo is "Facilities Master Plan (Draft)." This Memo and a 780 page long Draft Facilities Master Plan were included on the September 28, 2015 BOE Business Meeting Agenda. The Plan describes potential capital projects that may need to be completed at each of the districts schools over the next ten years. The Draft Facilities Plan can be accessed at: http://www.boarddocs.com/il/hccsdil/Board.nsf/files/A2SNAB5719B5/$file/Facilities%20Master%20Plan%20-%209.27.2015%20-%20reduced%20size.pdf. The DRAFT Facilities Master Plan is on the 9/28/15 BOE Meeting Agenda under "Informational Items." This means that the plan was not included on the Agenda for action purposes. The last line of Mr. Surma's Memo confirms this fact. We listened to the Podcast of this meeting to see whether the seven BOE Members had any substantive discussion on the 780 page long DRAFT. They did NOT. The Podcast for this meeting can be accessed at: http://livestream.com/ccsd181/boe/videos/108652985. The "discussion" - if you want to even call it that -- on the 780 page long DRAFT Facilities Master Plan that covers all NINE schools, lasted a grand total of 3 minutes and 4 seconds between Time Counter 3:04:50 and 3:07:54. What is fascinating is that the "discussion" on this informational agenda item came after 10 pm and hours into a meeting at which the focus was on selecting the architecture firm to build a new HMS. Here is the link to the Agenda, so you can check it out for yourself: http://www.boarddocs.com/il/hccsdil/Board.nsf/goto?open&id=9ZXQ5B56F178. Dr. White starts off "joking" about the plan by saying, "I was hoping Ken would do a thousand slide presentation this evening, but I'm going to ask him not to do that." He follows up this "funny remark" with "One of our goals was to get you a DRAFT Facilities Master plan, you see that in the board packet. It's not intended to be anything more than a draft. At this point it has not been vetted by the Facilities Committee. The committee still needs to have that work done so that we can prioritize if you will and provide the board options as you consider that as part of future work. We met the target of at least getting a draft in your hands as a starting place." Dr. White then ends his "presentation" by stating "So, as you review it, let us know if you have questions or comments as to how we might be able to restructure it to meet your needs." What is clear is that this DRAFT was intended by the Administration to "check the box" so to speak and meet one of the board's goals. A draft, however, is useless, if it is not substantively reviewed in FULL, which it was not on September 28, 2015, or any date since then by either the BOE or the Facilities Committee. As Dr. White pointed out, even the Facilities Committee had not "vetted" the Draft before it was shown to the BOE! Yet despite these FACTS, between 9/28/15 and December 2015, the BOE was asked by the Administration to plow ahead with a decision to go to referendum to build a new HMS, only ONE of the NINE buildings whose needs are addressed in the DRAFT! 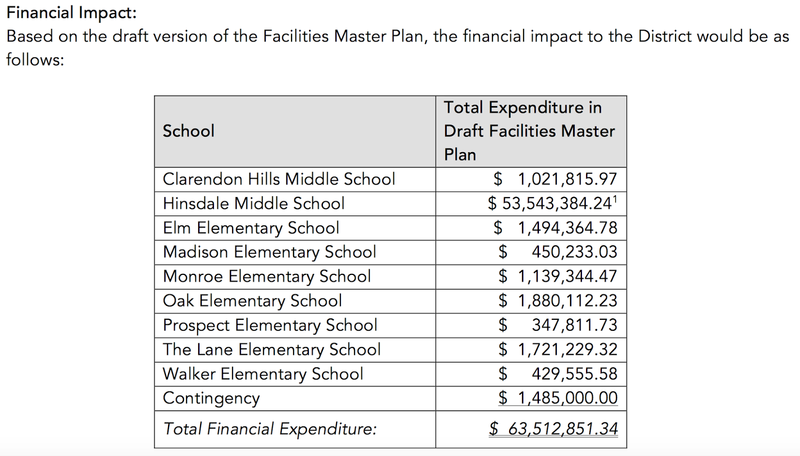 Following Dr. White's "presentation," the only board member to speak on this Draft was the Board President, who asked Mr. Surma to explain what in the Draft addressed potential expenses that might need to be incurred on Hinsdale Middle School if the BOE decided not to go to referendum. He highlighted that the report included $50 million to build a new HMS and an additional $3 million to cover identified repairs that HMS would need if a new school wasn't built. What caught our attention was when he stated that he had "budgeted" or "put in" $50 million to build a new school. That amount is $15 million LESS than the $65 million referendum amount! That was the extent of the FULL BOE and Administrative discussion on the DRAFT Facilities Master Plan in the last 2 1/2 years (to use the date in the HMS Mailer)! And to repeat, the Plan has NOT BEEN VETTED, FINALIZED OR APPROVED by the FULL BOE! 4. You will note several things from Mr. Surma's Snap Shot. First, he claims that the "Financial Impact" of all projects were completed in the Draft Facilities Master Plan would be $63,512,851.34. His line item for HMS is consistent with what he stated during the 9/28/15 board meeting -- he lists an amount of $53,543,384.24. The footnote referenced after this amount is included at the end of his memo and states: "1 This total includes $50,000,000 for the possible construction of a new or renovated Hinsdale Middle School along with the expenditures associated with items identified in the Facility Condition Assessment Report and Life/Safety Survey. " 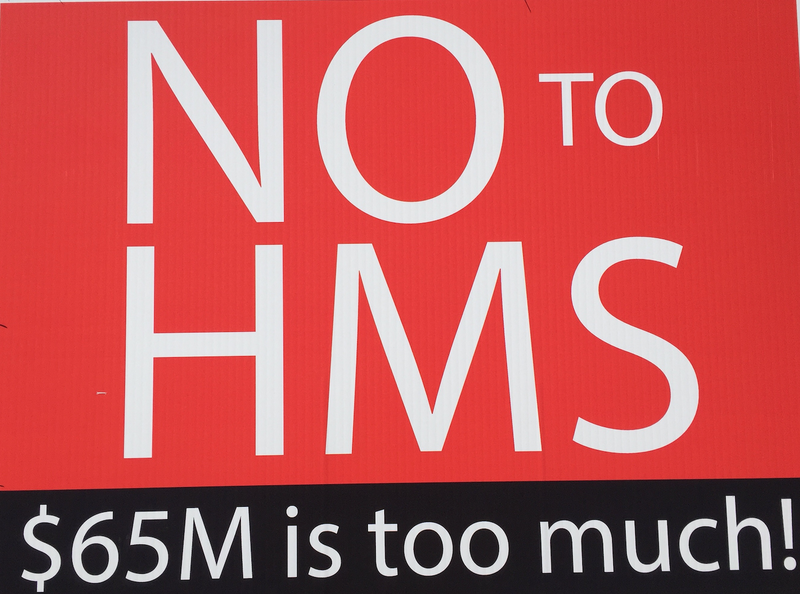 So, according to Mr. Surma, the new HMS would cost $50 million. The other 8 schools' identified capital projects totaled nearly $10 million -- to be exact, $9,969,467.10. 5. Yet NONE of the capital projects identified in the Draft Plan for the other EIGHT schools were substantively discussed by the BOE before they decided to move forward with a $65 million school. Of course, this means that the Total Financial Expenditure listed in Mr. Surma's 9/28/15 Memo is no longer accurate. The total now stands at nearly $75 million (we have not included the +$3 million expenditures Mr. Surma indicated were included in the Draft for work to be done to HMS if there was no referendum). 6. In further reviewing the materials that the Facilities Committee reviewed the last time they EVER discussed the DRAFT Facilities Master Plan -- September 17, 2015 -- (Click to Open Committee Meeting Agenda) -- we also found a document titled: Projects Eliminated from Facilities Master Plan. It can be accessed at: http://www.boarddocs.com/il/hccsdil/Board.nsf/files/A2DNC754A14E/$file/FMP%20-%20Projects%20Eliminated%20from%20Facilites%20Master%20Plan.pdf. This document identifies nearly $33.3 million in capital projects for all nine schools that were ELIMINATED from the DRAFT Plan that the BOE was ultimately shown on September 28, 2015. 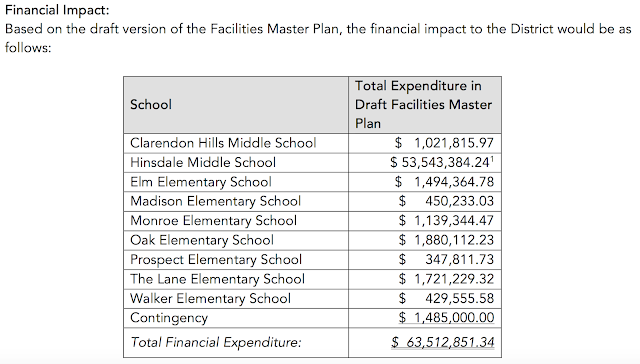 Of the $33.3 million, $15 Million was included for Hinsdale Middle School's NEW BUILDING CONSTRUCTION, leaving $18.3 million in additional capital projects for the other 8 schools. We did not listen to the podcast of this meeting, because what was critical to us was that somehow before the BOE ever was shown the DRAFT Plan, the Facilities Committee reduced nearly $28.3 million in capital projects that had been identified for 8 schools, down to under $10 million WITHOUT the FULL BOE ever getting to participate in a substantive discussion on this "winnowing down." But of GREATER significance to the current $65 million HMS referendum we are being asked to approve, is the fact that someone -- Mr. Surma or the Facilities committee??? -- decided to reduce the amount to build a new HMS from $65 million to $50 million and only reflect $50 million in the DRAFT Facilities Master Plan. So there you have it -- ADDITIONAL FACTS -- regarding the work of Dr. White, Mr. Surma, the Facilities Committee and BOE and the District-Wide Facilities Master Plan listed in Fact 1 of the HMS MAILER. What do these facts reveal? They reveal that the Plan is still just a draft. If one is to believe Dr. White, as of 9/28/15, this district wide plan had not been vetted by either the Facilities Committee or the BOE. Since that date, it hasn't been either. There is NO FINAL, BOARD APPROVED Facilities Master Plan. The BOE's last "look see" into the informational material that Dr. White and Mr. Surma presented them to review on 9/28/15 listed the amount budgeted (or to use Mr. Surma's corrected phrase -- "put in") for construction of a new HMS at $50 million, not the $65 million that the board approved in December 2015. Since deciding to build a new middle school, selecting an architect and allowing the price of the winning architect's proposal to swing wildly from $46 million to $73 million to $65 million all in the course of two weeks, Dr. White has NEVER asked the BOE to go back to the DRAFT Facilities Master Plan to see if they were on target. Nor have they discussed how or when they will finance the $10 million in projects for the other 8 schools. Nor have they discussed why additional $18.3 million in projects identified for the other 8 schools were eliminated from the Draft Facilities Master Plan. Shouldn't each of the following steps have been taken BEFORE the Administration asked the BOE to approve going to referendum on HMS? Step 1 -- Discuss the substance of the DRAFT plan -- what is included for each school, what was eliminated for each school and why, what will the plan cost to implement and how will the projects be funded? Step 3 -- Prioritize the projects. Step 4 -- Decide the timeline for when each of the prioritized projects will be undertaken. Step 5 -- Decide how the projects would be funded and if necessary if, when and for what amount to go to referendum. Step 6 -- ESTABLISH a BUDGET in the Facilities Master Plan for each project -- including a new HMS -- that will cap the amount architects are allowed to use in developing their proposals for the project. NONE of these steps were taken, and yet, in two days, we are being asked to approve a referendum to build a $65 million school, which was supposed to cost (at most) $50 million in the Draft Facilities Master Plan? We are being asked to approve a referendum for ONE school when the identified needs of the 8 other schools haven't been fully vetted by the BOE? Well, we are not going to condone the UNFINISHED WORK of Dr. White, Mr. Surma, the Facilities Committee or the FULL Board of Education. It is clear as day that they RUSHED the HMS referendum because they didn't want to put the question on the ballot during a national election -- they refused to slow the train down by a short 8 month period, enough time potentially to complete Steps 1 through 6 above, because they wanted to avoid the November election. They didn't want to risk putting their referendum question on a ballot that might also include a D86 referendum question. Well, in our opinion, that is simply inappropriate and reckless and irresponsible. The HMS MAILER does a great job obfuscating all of these undisclosed facts by listing 9 additional "facts." We are not going to take the time needed to dissect each of them. We started a list of additional information that is not included in them, but decided that undisclosed information surrounding Fact 1 is so damning that it is not necessary to go beyond it. On March 15, 2016, we are going to VOTE NO on the HMS Referendum. We hope you will join us. It is time for all parties involved to FINISH what they started and FIRST finalize the DISTRICT-WIDE Facilities Master Plan. Only then can the BOE make any kind of fiscally responsible decisions that take into consideration the needs at ALL of our schools. Tonight we begin a new Series that deals with the March 15 HMS Referendum. Five days from now, the polls will be closed and D181 taxpayers will have cast their votes on whether to authorize the building of a new $65 million Hinsdale Middle School ($90 million with bond interest). We encourage all D181 residents to cast their vote on or before Tuesday and let the democratic process play out. YES, NO, WIN, LOSE (depending what side of the debate you fall on), come Wednesday morning a decision on the $65 million referendum question will be made, and we will all have to live with the results. Voters should take the time to review all of the available information before they make a final decision. 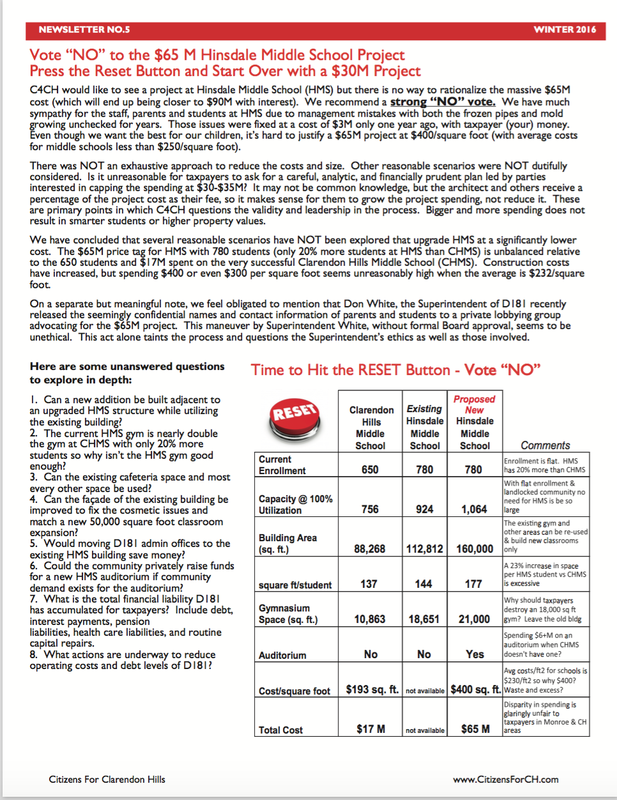 D181 has sent out out many newsletters and posted documents to its website that deal exclusively with the HMS referendum. This Series will address the information that D181 has highlighted and the information it has chosen to gloss over or simply not present. We leave it to you to decide the significance of the information, misinformation or lack of information that D181 has been circulating. This flyer was NOT prepared or paid for by the Vote Yes For HMS citizen's committee. Rather, it clearly states that it is "A Publication from Community Consolidated School District 181." That means that it was most likely created by the very highly paid D181 Communications Director. Since it was delivered through the US mail, in addition to the paper and ink supplies needed for the thousands of flyers printed and mailed to all D181's Postal Patrons, the postage was also paid for with D181 taxpayer dollars. We'd like to start off by asking, HOW MUCH DID THESE MAILERS COST? DID THE BOE AUTHORIZE TAXPAYER MONEY TO BE USED FOR THESE FLYERS? Now we all know that D181 administrators and BOE members are not allowed, under Illinois law, to advocate or encourage YES votes. To do so is illegal. They are only allowed to present FACTS regarding the referendum. This creates a lot of gray areas, where one could argue that by not presenting ALL the facts that might lead a taxpayer to vote NO, the D181 administration is in effect encouraging YES votes. We will leave it up to you to decide whether or not this flyer was the "objective"type of brochure that is permissible by law. In our opinion, the D181 administration conveniently omitted many FACTS that might lead D181 taxpayers to vote NO. In the interest of fairness, each part of this Series will copy D181's presentation of facts in BLUE. Then we will post additional FACTS in RED that we think you should consider before election day. 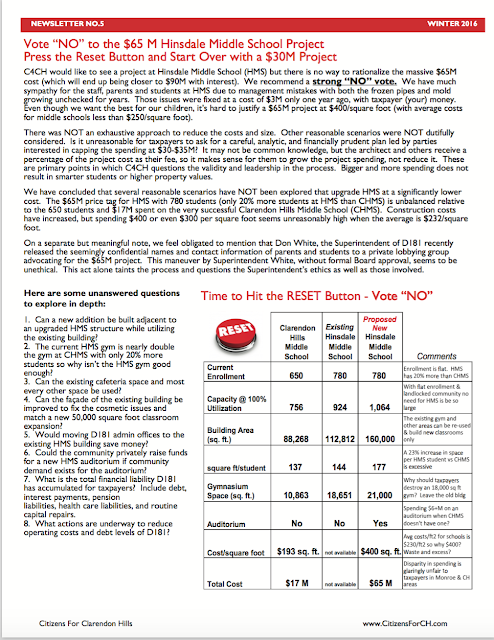 Part 1 of this Series presents additional FACTS on the Cost and Impact Analysis discussed in the D181 mailer. "Should the referendum be approved, the Board has determined that payment of the new debt would begin in 2018-19, when construction of the HMS building is to be completed. Therefore, homeowners would see an increase in their tax payment in 2019 (estimated at $263 for a $500,000 home and $537 for a $1 million home). However, because the District's existing debt will be paid in full by Fiscal Year 2024, homeowners would see a decrease in their tax payment in 2025 (estimated at $382 for a $500,000 home and $781 for a $1 million home). If the final costs were less than $65 million, the Board of Education would not sell bonds for $65 million, but rather only sell bonds for the actual amount needed. The Board would not have the option of using remaining funds for another project (i.e. facility work at another school),as the referendum seeks approval to use the funds specifically for the HMS facility project." 1. 2025 should be the long awaited year when property tax bills decrease after the bonds that financed the last four referenda are finally paid off with our hard earned tax dollars. According to the information provided on the HMS Referendum Debt Service and Homeowner Impact Analysis prepared by the D181 administration a $500,000 home CURRENTLY pays $563/year and a $1 million home CURRENTLY pays $1147/year in taxes to pay for the bonds used to finance the past referenda. No doubt, many families in D181 would love to have that extra money to spend on their personal "needs," not just their "wants." Alas, that will not happen if the HMS referendum is approved. 2. If the HMS referendum is approved, a $500,000 home will pay an ADDITIONAL $263/year for the first six years (2019-2024) after HMS is built. The property tax payment for the HMS referendum bonds will then INCREASE to $444/year for the next 12 years (2025-2036). A $1 million home will pay an ADDITIONAL $537/year for the first six years (2019-2024). The property tax payment for the HMS referenda bonds will then iINCREASE to $903/year for the next 12 years (2019-2036). 3. To suggest that a taxpayer's bill will GO DOWN after 2025 is a spin on the truth of the HMS referendum facts. The FACT is that the portion of your tax bill that covers repayment of the HMS referendum bonds will INCREASE in 2025 by 60%. While you will no longer have to pay for repayment of the bonds that financed the past referenda, in our opinion, it is disingenuous for the D181 administration to not thoroughly explain this fact and spin it as an overall tax decrease starting in 2025. $500,000 home will pay $6906. $1 million home will pay $14,058. The amounts listed above are not insignificant. In fact, what D181 taxpayers need to remember is that these amounts are in ADDITION to the rest of the property taxes that they pay to D181 to fund the day to day operations, teacher salaries and programs in all 9 schools, and they pay these taxes whether or not they have a student attending the schools. Each voter will have to make a personal decision on whether they can afford to pay the above amounts to build ONE school. And even if they can afford it, they must decide whether the $65 million project is is the right one, at the right time for a district (as some of our readers have pointed out) that faces future financial uncertainty. * This is an estimate based upon the information provided in the HMS Referendum Debt Service and Homeowner Impact Analysis on the D181 website. Comment of the Day: The Hinsdalean's Editorial is Indefensible. Vote NO. Moments ago, we received the following comment, in response to our last Comment of the Day. We have decided to post it as a new Comment of the Day because we believe that it is a perfect rebuttal to the Hinsdalean's "indefensible" article encouraging voters to vote yes and not worry about the future. I don't hold any ill will toward the yes HMS crowd, and as with many who plan to vote no, understand all the arguments for a new HMS, not just this one at this time. The Hinsdalean editorial is indefensible. To begin with, the Hinsdalean fantasy that we don't know what will happen in the future is without any foundation. We know what will happen, we just don't know how. We are going to get clobbered. See today's article outlining the disparity between rich and poor districts in Illinois. The worst in the nation. At the end of the day, we will lose substantial monies. http://www.chicagotribune.com/ct-sta-kadner-sudies-st-0327-20150326-column.html. I guess the Hinsdalean is right, we don't know when. Yet, any logical analysis would say soon. The Illinois financial crisis has been going on for decades as the can is kicked down the road. Will it continue for another ten years without resolution, that seems unlikely. Will it continue for six months, that seems likely. Sometime between six months and ten years we will be clobbered by increased taxes or lost money. And no one is going to tap us on the shoulder and say, "it's coming", it will just come. The signs are sooner rather than later. Our universities are not being funded. CPS teachers are being furloughed. We don't have a budget. Chicago has raised property taxes and will raise them again. Chicago wants our money. The Courts have ordered various payments be made. Vendors are owed billions of dollars. Does this sound like a who knows scenario or more like sooner rather than later scenario. As for the idea that curriculum and capital expenditures are entirely "separate" and can be conceptually isolated, that is also indefensible. We have one pot of money, divided up. But the idea that they are separate goes beyond the idea that we are one community with one set of finite resources. Curriculum and capital expenditures also compete for the energy and talent of the administration. We are in the process of trying to fix the curriculum. A big shiny new building will be a lovely thing to work on, instead of digging into the muck of statistics, test results, and unhappy parents. Perhaps this provides some insight into why the administration is in love with the new building. It needs a win. A big shiny new win. It needs a legacy. Not only would the building be a big shiny new win, it would be a distraction. Just like a magician distracting the audience with one hand, while it hides the coins with the other, the building will be a positive focal point to distract people. How else to explain the mysterious and illegal release of data and burying the actual price of the building. Well, I hear angry yesers, crying "what about the benefits." Ok, a new HMS would provide benefits. If you are going to spend 65 million dollars, you should have an upside. This is the cry for support for every government expenditure. Every government program that takes taxpayer money provides some benefit to someone. Couldn't we also provide more teachers, a dedicated language lab committed to teaching mandarin, subsidized travel to academic competition, one on one meetings with STEM professors from area universities, free memberships and travel to lifetime fitness. How about a greenhouse and agriculture lab on the existing bowl. That would be super cool. We could do a lot. The Yes crowd crowing about the benefits doesn't move me. How about this question. Is there anything we could do with 65 million dollars, other than build a new school, that would provide less actual educational benefit to the kids than a vanity project to fit in with downtown Hinsdale style? I am hard pressed to think of anything reasonable. The question is always, in a world of finite resources, compared to what? How is this building compared to a more utilitarian structure. How is this building compared to waiting, and focusing financial and administrative resources on existing, overdue, pressing curriculum reforms. How is this building compared to upcoming repairs? My understanding is that the trailers are 50,000 a year and that the building is safe and largely fixed. Is spending 65 million dollars now really the most likely way that all students can benefit academically. It sure seems like a vanity project for the administration and for those residents who love the idea of a fancy new school. Finally, if I could get over all of that, I can't get over the process. In particular, the last minute 20 million dollar increase in price. How did that happen? In any other organization, it would be cause for self-reflection and apology. Here, the people who wonder about are portrayed as luddites and selfish. Wow. And, what about the price per square foot. All the material posted and circulated lacks any support for over 400 per square foot for a middle school. I looked and cannot find a similar price. And, the comparisons with Hubble have been shown to be baseless, without any serious rebuttal. HMS is an odd looking building that may well require regular repairs. A new school might well be a worthwhile investment. Moving to 55th and Garfiled seems pointless--the kids benefit from being near downtown and not a busy intersection. The facilities committee worked hard, and must be chagrined to find its work under scrutiny. I don't blame any member that strongly defends its work--the emotional investment must be overwhelming any reason at this time. Yet, in the end, in light of all circumstances, the timing, the safety of the current building, the administration's desperate need for a win at all costs, the shaky financial data, and the state of our state, the answer has to be no. Earlier this evening we received the following comment from former BOE member Yvonne Mayer. It speaks for itself. Please post the following as a free-standing post. Thank you. Today, Hinsdale's local newspaper, The Hinsdalean, ran a story endorsing the upcoming $65 million referendum for a new Hinsdale Middle School and urging voters to vote yes. The Vote Yes For HMS pro-referendum group promptly applauded this article and proclaimed their love for the editorial's comment that "Decisions must be based on current conditions rather than fears over future scenarios." Pam Lannom, the Hinsdalean's editor, who does NOT live in D181 and therefore won't be contributing her tax dollars to either a new school or any aspect of D181's offerings, made this ludicrous suggestion as a response to concerns citizens, such as myself, have made that the referendum should have been vetted in the broader context of possible legislative proposals. These proposals include shifting millions in pension liabilities to individual school districts, freezing property taxes (and therefore the District's revenue stream) or cutting Special education funding (funding which the district will then need to assume under Federal and State mandates). So the following is a comment I posted to the Vote Yes Facebook page's glee over Pam's article: "I completely disagree. Pam Lannom has never served on the D181 BOE and her statement is simply irresponsible. Her failure and YOURS to recognize that the BOE and the Administration need to be planning for the "rainy day" scenario which will come to the State of Illinois and trickle down rapidly to "rich" districts like ours is disappointing. Change is coming and revenues will decline in D181's coffers and the end result will be cutting programs, teachers or asking D181 voters to approve tax increases above the tax cap in order to raise needed funds to maintain existing programs and teacher levels. The needs of one school -- which are real -- should have been discussed in the broader context of the "what if's" that most intelligent Illinois residents realize are going to happen, in one form or another. At the end of the day, voters will decide the future of HMS and most likely, down the road, the future of maintaining what goes on in D181's classrooms. Too bad that the Administration refused to have even ONE SINGLE discussion about the district's future with the BOE (or with the community, for that matter, in the form of a Town Hall Meeting) before rushing to referendum. That's my opinion as a former board member who already had to cut $5 million from the D181 budget less than 8 years ago. We were lucky then, because no teachers had to be fired, but the hopes of better foreign language offerings, smaller class sizes and full day kindergarten were all scrapped. There isn't "fluff" in the budget anymore, so if things need to be cut in the future, our children will lose out -- in ALL buildings." I will sadly, be voting NO on the upcoming referendum, and if it fails, hope that all parties will return to the drawing board to bring a more fiscally responsible proposal back to the taxpayers that also will protect the existing programs and teacher levels in D181 at ALL schools. No doubt, some D181 taxpayers who support the referendum will attack me (as I've already been attacked on the Vote Yes Page), but as a former elected BOE member in D181, I stand by my concerns over the process, price tag and future financial health of the district. What have the Past D181 Referenda Cost? What have the Past D181 Referenda Paid For? The four successful referenda were approved in 1997, 2000, 2002 and 2004. The grand total for the last FOUR successful referenda was $74.7 million, only $9.7 million more than D181 is asking taxpayers to approve for one SINGLE $65 million referendum. Within the last FOUR successful referenda, three NEW schools were built -- CHMS (which was needed as a result of population increases that required not replacing, rather adding an entire new school to house the growing student body), Walker and Prospect. For these THREE schools, taxpayers were asked to approve $33,034,401, nearly 1/2 of what taxpayers are now being asked to approve to REPLACE one single school. Of the remaining $41.67 million in funds raised in the last four referenda, Madison school first received a gym and later a second large addition and renovations (a renovation so large that students were housed for one year at the old Prospect School before it was demolished), The Lane received an addition and renovations, Monroe received an addition and renovations, Oak received an addition and renovations, Elm received an addition and renovations and ALL schools (including HMS) were equipped with a new technology system and equipment. Clarendon Hills students ALONG WITH ALL OTHER D181 students received benefits from the past referenda. The $74.7 million in referenda funds approved by D181 taxpayers paid for 3 new schools, additions and renovations to 5 schools and installation of new technology systems and equipment to all 9 schools. Bond repayment on the $74.7 million will not be completed until 2025. Yet on March 15, D181 taxpayers are being asked to approve a $65 million referendum for construction of ONE SCHOOL? The following language was used in past ballot measures presented by District 181 for the purpose of facilities / capital projects, each of which was successfully passed by the community between 1997 and 2004. Shall the Board of Education of Community Consolidated School District Number 181, DuPage and Cook Counties, Illinois, replace the existing Walker School; repair, renovate and equip and build and equip additions to Madison School, Oak School and Elm School; improve all of the District's school buildings with new technology systems and equipment, and issue bonds of said School District in the amount of $31,000,000.00 for said purposes? • Within that total, the cost of the Walker School construction was estimated at $8,234,401. Shall the Board of Education of Community Consolidated School District Number 181, DuPage and Cook Counties, Illinois, build and equip a new school building on and adjacent to the existing Prospect School site, acquire additional real property adjacent to the Prospect School site, repair, renovate and equip Monroe School, build and equip an addition to Monroe School, and issue bonds of said School District in the amount of $24,000,000.00 for said purposes? • Within that total, the cost of Prospect School construction was estimated at $12.5 million. Shall the Board of Education of Community Consolidated School District Number 181, DuPage and Cook Counties, Illinois, build and equip an addition to and alter, equip and repair The Lane School and issue the bonds of said School District to the amount of $6,300,000.00 for said purposes? Shall the Board of Education of Community Consolidated School District Number 181, DuPage and Cook Counties, Illinois, build and equip a a gymnasium addition to, the current Madison School, and issue bonds of said School District in the amount of $600,000.00 for said purpose? Shall the Board of Education of Community Consolidated School District Number 181, DuPage and Cook Counties, Illinois, build and equip a new middle school and acquire additional school grounds for such purpose and issue bonds of said School District in the amount of $12,800,000.00 for said purpose? • At the time of the election, it was estimated that occupancy would begin in the fall of 1999 for 650 students in 89,000 square feet. Building cost was said to be $137 per square foot, and the cost to a property owner of a $300,000 market value home was said to be $69.38 per year. It was noted at the time: "Final decisions on the school's design and attendance boundaries would be made, with community involvement, following passage of the referendum." And that, "District reserves would be used to fund additional work at the current middle school in the areas of tech wiring, carpet replacement, and electrical, heating, ventilation, and air-conditioning upgrades." 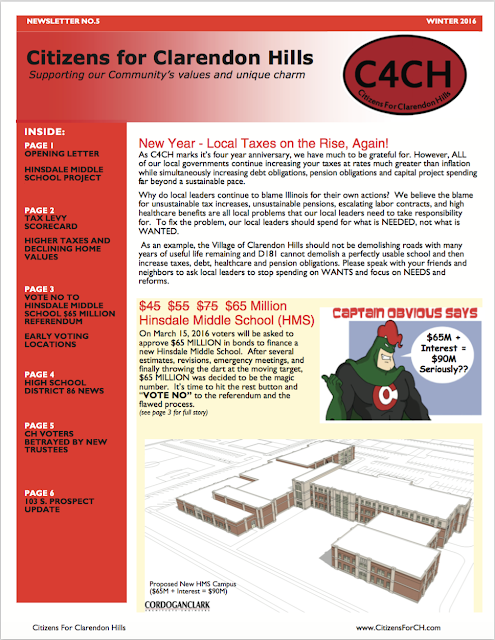 We have now obtained a copy of the actual newsletter that the Citizens for Clarendon Hills mailed to CH residents earlier this week. Below are images of the pages from the newsletter that contain information and commentary relative to the March 15, 2016 Referendum.